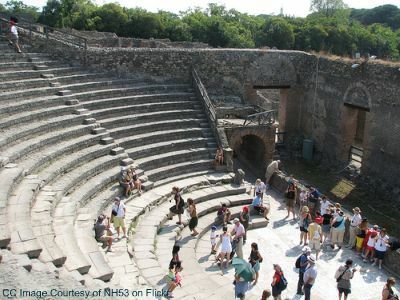 "Pompeii Ruins - find out more about the baths, theatres, temples and defensive walls of the ancient city of Pompeii..."
As in other Roman cities of that time, the theatres of Pompeii held a major role in its life. 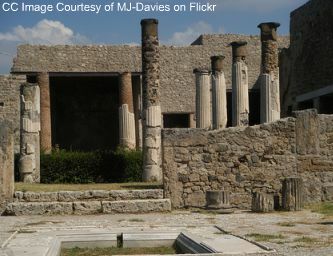 Pompeii had two theatres: the small one, the Odeon, was built in the 1st Ct. BC. It could hold up to 1000 spectators and it hosted plays, musical events as well as poetry readings. According to inscriptions found here, it had a roof to ensure excellent acoustics and protect people from the weather influences. The Large Theatre of Pompeii was built in the 2nd Ct BC and could hold up to 5000 spectators. Just like the small theatre, this one was of the Greek-type, too, which means it conformed to the terrain arround it. Roman-type theatres were self-standing and depended on the architectural structure only. Plays, mimes and pantomimes were peerformed here. The Amphitheatre of Pompeii, situated in the southeast corner of the the lost city of Pompeii, was built around 70 BC by two of Sulla's commanders. It is the oldest surviving pre-Colosseum style amphitheatre arena in the Roman world. It held over 20 000 spectators and was used for gladiator battles. Just like the theatres, the baths also had a very important role in the social life of every Roman city: they provided a place for people to meet up and socialize. Only a limited number of well-to-do families could provide their own baths, so the thermae of the city public baths catered to all the others. Find out more about those you can see in the ancient city of Pompeii in our article Pompeii Baths. The temples of the lost city of Pompeii are not much different from other temples whose looks were based on Hellenistic models around other colonies of Magna Graecia. There were a few different types of temples according to the position of the colonnades within the temple. Another point of distinction of the style of the temple was the kind of columns used: they could be either Doric, Ionic or Corinthian order. Temple of Apollo - this temple was dedicated to the Greek and Roman god Apollo whose cult was imported from Greece. The history of the temple goes all the way back to the 6th Ct BC although the layout we can see today dates from the 2nd Ct BC. It was the town's most important religious building for a very long time and an integral part of the Forum area. Its style is a fusion of Greek and Italic elements. There were statues of Apollo and Diana depicted as archers found there. They are now kept in the National Archeological Museum in Naples. The Great Temple of Jupiter - Built in 150 BC, this temple became the main temple of Pompeii after the Roman conquest. It's standing at the northern side of the Forum. In 80 BC, it was dedicated to the worship of 'Capitoline Triade' (the union of the three most important Roman deities), Juno, Jupiter and Minerva so there were three niches in the temple that housed their statues. Temple of Isis dates from pre-roman times. It was dedicated to Egyptian goddess of Isis whose worship spread throughout the Greco-Roman world. It is thought to have arrived in Pompeii around 100 BC. Isis was worshipped as the ideal mother, wife, matron of nature and magic. Badly damaged in the earthquake of 62 AD, it was almost entirely rebuilt at the time of the Vesuvius erruption 79 AD. It included many Egyptian features in its decoration. Original paintings and sculptures can be seen in the Archaeological Museum of Naples. The ancient city of Pompeii was encircled by three and a half kilometers of defensive walls that also defined the area of the town's expansion. 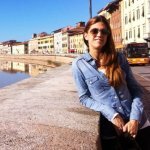 The wall consisted of a double wall of stone blocks with rubble in between. The wall was pierced by seven gates (Porta Marina, the Herculaneum gate, the Vesuvius gate, the Nola gate, the Sarno gate, the Nocera gate, the Stabia gate). The system of fortifications had at least four phases of construction between the 6th Ct BC and the end of the 2nd Ct BC: from a simple earthwork construction to a strong defence system flanked with 12 towers. For Pompeii ruins streetview check here. Ancient city Pompeii - Pompeii ruins opening hours and admission.